Okay, this whole foraging venture is new to me, so nothing you read here should be construed as advice to eat particular plants. And there is still a part of me that fears eating a poisonous imposter and dying a slow and awful death owing to my lack of attention to detail, groaning with deep regret as I lie in the woods, fading into unconsciousness. 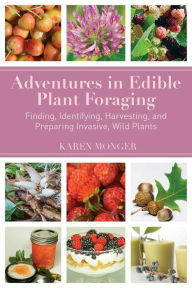 That being said, I am cautiously inspired by two talks Gavin and I had the good fortune to hear about foraging for edible plants, both given by Karen Monger, author of Adventures in Edible Plant Foraging and one of The 3 Foragers. At both talks, Karen’s husband served cold linden tea, and I learned that linden trees are often found in planted landscapes and parking lot medians/perimeters (versus more randomly, on walks through the woods). I will be looking for the yellowish-white flowers next spring, hoping to get my hands sticky with the harvest. (Of course, good foraging etiquette dictates that you ask before harvesting, but I am assuming someone will oblige). I imagine locally harvested linden tea in the winter would be a sweet reminder of greener times to come! So far, I’ve nibbled on lemony-sour sorrel and grapey-tasting (no surprise there) grape tendrils on my own. I already know, without needing to have my hand held, that the wild berries are coming in soon (only now I will call most of them wine berries instead of wild raspberries). I even have a pie recipe at the ready. (By the way, the term weed is pretty subjective! See The Heroic Milkweed for Emerson’s quote on same, and more info on the infinity of uses for plants! I haven’t yet delved into milkweed eating, although I am told it can be done!). ← Galls: What Hides Within?